Great for everything from Classic Rock to today’s Metal, these hot wound Duo Rails deliver! These are humbuckers in the size of a standard Strat single coil so you don’t have to carve up your body in order to get the humbucking features and versatility you want. Not just for Strats, these synergistic pickups are the hottest passives we carry in this size and can be used in any standard single coil space (not tele-sized! ); check the measurements provided prior to purchase and let us know if you have any questions. 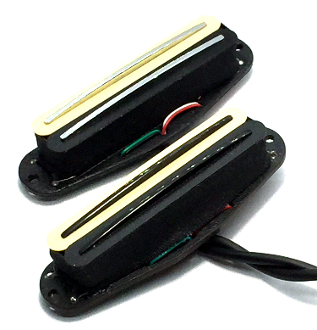 The Ceramic magnets featured in these pickups provide crisp, clean, modern tone. These Duo Rails are interchangeable and can work in any position to give you flexible installation and play options. Explore your boundaries with these 4-wire pickups providing humbucking performance and the ability to coil-split. You can also add series parallel functionality for even more control. Spice it up and take advantage of these wiring options afforded to few Strat pickups. 500K pots and 0.047 tone caps (available separately) are recommended for use with these pickups. Basic wire color codes let you know which wires are hot and which are grounds.